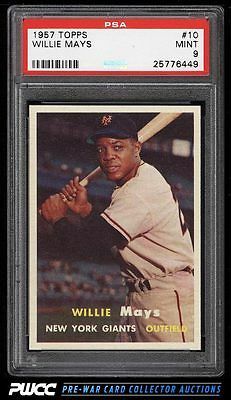 The single finest copy we've brokered in our history and certainly on the short list of truly elite '57 Mays's in the hobby. Recently graded and comes from an original collection and just returned from PSA earlier this year. This card simply shines with four conservatively MINT corners, fresh surfaces, and near flawless centering. The print, color, and focus are exceptional for the issue. As good as it gets and worthy of the finest collection. One of nearly 20,000 cards, lots, and sets up for bid in our 7th Auction of 2016. Click on the link above to view the other PWCC auction lots.